Who invented the Mechanical Reaper? The name of the person credited with inventing the Mechanical Reaper is Cyrus McCormick (1809 - 1884). Cyrus McCormick is not only famous as the American inventor of the Mechanical Reaper but also as a designer and industrialist. When was the Reaper invented? Cyrus McCormick invented the Mechanical Reaper in 1831, during the First US Industrial Revolution (1700 - 1860) period of invention. The McCormick Mechanical reaper revolutionized farming techniques by speeding the process of harvesting wheat by replacing the manual cutting process, using scythes and sickles, to gathering ripened crops with a machine. Definition of the Mechanical Reaper: The Mechanical Reaper is defined as an early farm machine that cut and gathered (harvested) a food crop from the fields, replacing the labor intensive cutting of the crop with sickles and scythes. Fact 1: Who invented the Mechanical Reaper? The Mechanical Reaper was invented by Cyrus McCormick in 1831 during the First US Industrial Revolution era of inventions (1700 - 1860) which was a marked addition to advancements made in the area of Agriculture. Fact 2: Who invented the Mechanical Reaper? Prior to the invention of the Mechanical Reaper in 1831, crops were gathered and harvested manually used basic farming tools such as the scythe and the sickle. It was back breaking work and labor intensive. Fact 3: Who invented the Mechanical Reaper? Farming methods had improved in the cotton producing Southern states with the invention of the Eli Whitney Cotton Gin in 1793 and the development of the Samuel Slater cotton mills. In the east Jethro Wood had patented an iron-bladed plow in 1819 for the light, sandy New England soil. Fact 5: Who invented the Mechanical Reaper? Harvest time was a period of just a few weeks in which the precious crops had to be gathered. At harvest time there was a huge demand for labor on the wheat farms. The problem was that there was a massive shortage of labor to carry out this vital task. For instance, in 1830 the population of the whole of Illinois consisted of just 25,000 pioneer families. Fact 6: Who invented the Mechanical Reaper? The inventor of the Mechanical Reaper, Cyrus McCormick, was born on February 15, 1809 in Rockbridge County, Virginia, United States and died on May 13, 1884. Fact 7: Who invented the Mechanical Reaper? The early years of Cyrus McCormick were spent in Rockbridge County, Virginia, United States where he was raised 1200 acre family farm. His father was Robert McCormick, Jr. and his mother's name was Mary Ann Hall McCormick. Cyrus was the eldest of eight children. Fact 8: Who invented the Mechanical Reaper? Cyrus McCormick received a limited education at local schools and following his schooling he worked with his father on the family farm and in the family's blacksmith shop. Fact 9: Who invented the Mechanical Reaper? Several members of the McCormick had moved from Virginia to Illinois and had told Robert about the problems that were encountered in Illinois at Harvest time. Robert McCormick tried various methods to invent a mechanical reaper but all of his attempts had ended in failure. Fact 10: Who invented the Mechanical Reaper? In 1824 the young Cyrus McCormick, aged just age of 15 years old became interested in new ideas and, inspired by his father, invented a lightweight cradle for carting harvested grain. Fact 11: Who invented the Mechanical Reaper? The invention of a reliable mechanical Reaper proved illusive to his father but Cyrus, realizing the importance of a mechanical reaper, continued the quest using his father's basic design. He was aided by Jo Anderson, an African American slave who worked on the McCormick farm. Fact 12: Who invented the Mechanical Reaper? Meanwhile in Scotland an inventor and parish minister called Patrick Bell (1799 - 1869) invented, but never patented, a 2 wheel mechanical reaper that was pushed by horses in 1928. His idea was copied by William Manning and Obed Hussey who started working on similar designs in the United States. Fact 13: Who invented the Mechanical Reaper? In 1931 Cyrus McCormick invented the horse drawn, McCormick mechanical reaper with a vibrating cutter. His design for the Mechanical Reaper was pulled by horses and cut the grain to one side of the horse team. Fact 14: Who invented the Mechanical Reaper? In 1833 Obed Hussey (1792 - 1860) patented the 'Hussey Reaper' which would place him in fierce competition with Cyrus McCormick. Fact 15: Who invented the Mechanical Reaper? A US Patent was issued for the 'McCormick Reaper' on June 21, 1834. However the 'Hussey Reaper' used a saw-like cutter bar which cut stalks far more effectively than McCormick's Mechanical Reaper and was therefore perceived to be of better quality and achieved a greater financial success. Fact 16: Who invented the Mechanical Reaper? The financial Panic of 1837, together with the failure of the wheat crop, left Cyrus McCormick in considerable debt. Fact 17: Who invented the Mechanical Reaper? Cyrus McCormick was convinced that his Mechanical reaper would make him money and concentrated his efforts on making improvements to his original design. By 1843 he increased his sales to local farmers to 50 Mechanical Reaper machines a year and was out of debt and by 1845 the McCormick Reaper had come into general use. Fact 18: Who invented the Mechanical Reaper? 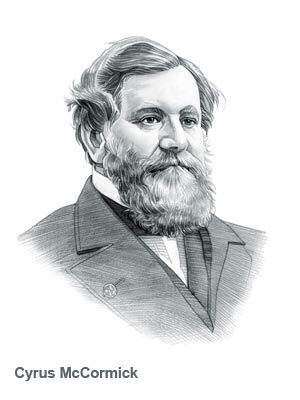 In 1846 Cyrus McCormick made the decision to move from Virginia to Chicago, Illinois, the central hub for wheat growers with good transportation links via the Mississippi and Illinois Rivers. Illinois was a good location to expand his market and the following year he, together with his brother Leander J. McCormick (1819 - 1900) opened a factory in Chicago to produce the 'McCormick Reaper'. Their goal was to sell 500 Mechanical Reaper machines for the 1848 wheat harvest. They succeeded in their objective but were frustrated by the competition of the 'Hussey Reaper'. Fact 19: Who invented the Mechanical Reaper? In 1850 Cyrus McCormick acquired the rights to Obed Hussey's cutter-bar mechanism. He went on to improve the quality of his own Mechanical Reaper machines and as his business boomed so did the production of wheat contributing to the wealth of America. Fact 20: Who invented the Mechanical Reaper? In 1856, McCormick's factory was producing more than 4000 Mechanical reapers each year. Cyrus McCormick had succeeded in business and wanted a settled family life. He married his secretary Nancy Maria Fowler (1835–1923) in 1858, and the couple had seven children together. Fact 21: Who invented the Mechanical Reaper? In 1871 the Great Chicago Fire raged from October 8 to October 10, 1871 leaving 300 people dead, over 100,000 people homeless and over 17,000 structures burnt to the ground. Cyrus McCormick lost his factory but, encouraged by his wife, he built a new premises and the Mechanical Reaper business reopened in 1873. His health had begun to seriously deteriorate and he began to focus on social and philanthropic causes.. Fact 22: Who invented the Mechanical Reaper? In 1879, his brother Leander McCormick changed the company's name from "Cyrus H. McCormick and Brothers" to the "McCormick Harvesting Machine Company". Fact 23: Who invented the Mechanical Reaper? Cyrus McCormick died on May 13, 1884 at his home in Chicago. His famous invention of the Mechanical Reaper had revolutionized farming methods, increased productivity and saved farm workers from hours of back-breaking labor. Who Invented the Mechanical Reaper - Cyrus McCormick - Inventor - Mechanical Invention - Definition - Meaning - Famous - Important - Mechanical Reaper History - Mechanical Reaper Timeline - Innovation - Significant - Development - Agriculture - First - Mechanical Reaper Definition - Kids - Facts - Information - Info - Who invented the Mechanical Reaper - Dates - When - Why - Impact - Purpose - Use - New - Old - Amazing - Best - Definition - Meaning - Awesome - Cool American - History - Timeline - Who invented the Mechanical Reaper?